1 1. Put a lid on it! 5 5. Make it bigger! For many people, winter is about cozy open fires, slippers and huddling inside. Few people give much thought to their garden during the winter, let alone the compost pile. But composting in the winter gives your garden and soil a great head-start when spring finally comes. Read on for tips and hints to help you compost all year round and maximizing your free soil amendment whilst at the same time minimizing your impact on the environment. Did you know…. that the freeze-thaw cycles during the winter will actually help to start breaking down the materials in your compost pile. This means that they will decompose faster when spring arrives. Here are 6 ways to get the most out of your compost pile over the winter. We are all used to getting our gardens ready for winter; sheltering delicate plants, protecting clay pots, pruning and tidying up. So why not do the same to your compost pile? With just a few simple alterations you can help your compost pile stay active throughout the colder, winter months. 1. Put a lid on it! Excess water can be a problem for your compost pile. By simply putting a lid or roof on your compost pile you can help protect your compost from unwanted precipitation. Putting a tarp over your compost pile not only whisks away unwanted precipitation, but it also helps contain the internal heat from the pile where you want it – in the pile. Keeping your car in a carport or garage generally helps to keep it free from frost. You can do the same for your compost heap. If you usually compost with heaps, then build a simple protective structure around it. You may have been happily adding some of your vegetable and fruit peelings to your compost pile during the summer months. However, with the slower decomposition rates over the winter, these food scraps can attract unwanted rodents and other visitors to your compost pile. Look at alternatives such as bokashi composting and vermicomposting for your food scraps to keep these attractants out of your compost pile; more information below. The bacteria and life at the centre of a healthy compost pile will cause it to heat up and remain active during more of the cold winter months. It’s the edges of your pile that are exposed to the elements during the winter and will become cold and inactive. The bigger your pile, the longer your pile can remain active in the cold. A good rule of thumb to remember is that piles should be at least one cubic yard. Shredding your material before adding it to your pile has been shown to cause your pile to heat more uniformly and protect it from cold outside temperatures. Taking your food waste down to your compost pile doesn’t seem as appealing in the dark, cold, snow and wet. Instead, use an indoor composting method to store and compost all of your food waste during the winter and you’ll have no more winter trips to the compost pile. Compost piles are often warm and infrequently disturbed areas of your garden during the cold, winter months. This makes them great homes for mice, rats and other unwanted pests. Any food waste you add to your pile over winter will take a long time to break down and will become a great source of food for local wildlife. Warmth, quiet and food will mean that your compost pile will quickly become a haven for your local pest population. Turn your pile regularly (assuming it isn’t frozen!) to disturb wildlife. With the drop in temperatures, you’ll also notice a drop in the rate of decomposition in your compost pile. This means that any materials you add in the winter will likely sit there until things warm up in the spring. Make sure you leave plenty of room in your compost pile to accommodate any material that you may produce over the winter. Alternatively, make a separate pile and add this to your compost heap once your heap becomes more active in the spring. With a few alterations you can keep your compost pile composting over the winter for your garden and yard waste. 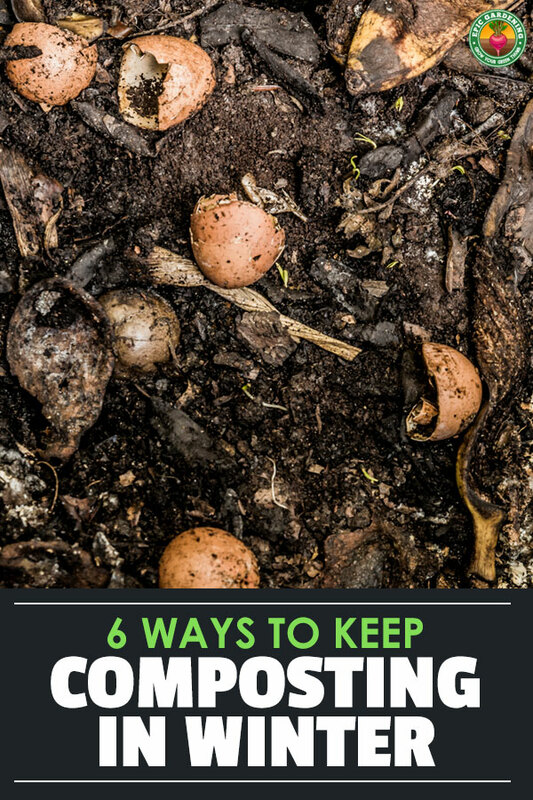 However, it is unlikely, that you will be able to successfully compost all of your food scraps this way throughout the year without attracting pests. But don’t worry; here are two great alternative composting methods out there to help you compost all of your food waste through the whole year. With the added bonus that they are both occur indoors where it is warm and dry and snowfree! A great option for composting all of your food waste throughout the year is bokashi composting. Bokashi composting is a process of fermentation that quickly and easily converts food waste into highly productive compost. The key to the bokashi process is fermentation. Through fermentation, bokashi composting generates the specialized microbes, yeast and fungi that are the primary building blocks of a healthy and productive soil structure. With bokashi composting, many of the challenges associated with ‘traditional’ composting are eliminated, and the majority of the process is completed conveniently right in your kitchen. While traditional back-yard composting works on select food scraps only, bokashi composting works on ALL food scraps: cooked foods, dairy, meat, grains, pasta, fruits and veggies, the lot of it. If you’re interested in the Bokashi composting method, feel free to visit Bokashi Living. A second option for composting indoors is vermicomposting or worm composting. Like bokashi composting, vermicomposting works well for small spaces and the worm composter can be stored indoors. The worms consume your kitchen waste and produce a fertile mix of worm poop and decomposed food waste. Good tip Todd. I’ve noticed the same when I dump a lot of coffee grounds in my pile!